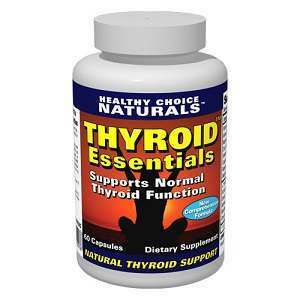 This is a review of Healthy Choice Naturals Thyroid Essentials Supplement which is, according to the product website, the most complete thyroid supplement that is available to consumers. It is reputed to be made up of 100% natural and stimulant-free ingredients, According to the manufacturer, the product regulates the thyroid and helps to support the body’s metabolism, maintain a healthy weight and replenish energy, The following paragraphs will provide some information on the product’s ingredients as well as proper therapeutic dosage, possible side effects and what one might expect to pay for the product. It is important to note that several of these ingredients, (i.e. Schizandra and Ashwagandha) are described as herb powder; no further information is available on the product website. The recommended dosage is no more than 2 capsules daily as a dietary supplement or as directed by your physician. The manufacturer does not list any side effects other than the supplement may be contraindicated for children below the age of 18,or women who are pregnant or nursing, and as with any medication or supplement, it is necessary to check with your doctor before you begin taking it. Upon further research, we found that the ingredient Schizandra is considered and used as a stimulant and may cause side effects such as loss of appetite, rash and gastrointestinal distress. The cost of the product is listed on the manufacturer’s website as $21.00 for 60 capsules (one bottle) and that price goes down with each extra bottle you purchase. The product is accompanied by what the manufacturer describes as an unconditional, money-back guarantee. A customer may return any portion of unused product and receive a full refund. Healthy Choice Naturals Thyroid Essentials Claims to be an all-natural, stimulant free supplement and shows a certain level of transparency in its advertising by listing all of the ingredients and offering what seems to be an inclusive guarantee. However, the vagueness of the ingredients listed as herb powder leaves customers wondering what the supplement actually contains. This concern coupled with the fact that the statements made on the website by the manufacturer are not back with any scientific or medical evidence and the manufacturer fails to mention possible side effects for at least one of their ingredients. All in all, this supplement may be well priced, but it’s ingredient descriptions are ambiguous and we are left wondering what other details have been left out and if they could possibly affect our health and well-being? More information than what is available is required before determining whether you should use this product or not. Lauren Shepherdson	reviewed Healthy Choice Naturals Thyroid Essentials	on August 10th	 and gave it a rating of 3.